Drawing on Buddha’s inspirational teachings, Kadam Bridget will guide us through uplifting talks and meditations. Through putting these teachings into practice we will find fresh insights and practical solutions to many of the problems we face in our modern life. Kadam Bridget is renowned for her ability to explain profound topics in simple terms, making them feel easy to understand and practice. 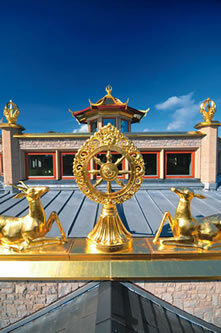 Every year, Manjushri KMC hosts two major international courses, the Spring Festival and Summer Festival. These Festivals provide a rare opportunity not only to receive teachings and empowerments from the Spiritual Director and Deputy Spiritual Director of the tradition but also to meditate and discuss with like minded people from all over the world.